I’m still slightly sad that I’m no longer rocking my Targus backpack. It’s too bad that it didn’t hold up as long as I wanted. I guess it did survive 6 years of service and in backpack years that’s a very long time. I struggled connecting with Oakley’s Kitchen Sink but I was able to use it for at least 4 years. The Kitchen Sink is a great bag for travelling because of the bottom compartment where I can throw in my dirty clothes or extra pair of shoes but it didn’t really work out for my daily commute. I was thinking about switching to the smaller version of the Kitchen Sink called the Bathroom Sink but couldn’t justify the cost. The Kitchen Sink is a trooper and carries about 3 days of gear. Again, not good for a daily commute. I guess I won’t really go into a complete comparison but I just wanted to note that I switched to the Momentum 30 from the Kitchen Sink. Sorry Kitchen Sink, I had to move on and I know you’ll find a good home. So more about the Momentum and why I chose it. 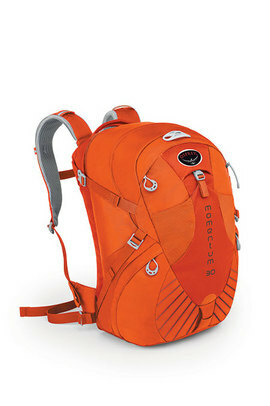 I poured through REI.com and looked through all the packs. My requirements were compartments, pockets, and a laptop sleeve. I guess I also wanted to stay around $100. I’m not a super camper, outdoors man, hiker, etc…so going with a name brand for hikers doesn’t really fit me. At the same time, I didn’t want to stick to the San Francisco stereotype of a Timbuk2 or Chrome Industries bag. I don’t believe those bags have the right ergonomic fit with the amount of gear I carry. I guess that was the other way I went backpack shopping: start with all the gear I carry. Really, I want the G1 from GoRuck.com with the lifetime guarantee. Hopefully one of these days I’ll get it. For now, I’m really enjoying the Osprey. Update: The bay area recently had rain storms. Guess who broke out the rain cover for the Momentum 30?